BIRMINGHAM, Ala. – In proof-of-concept experiments, University of Alabama at Birmingham researchers have highlighted a potential therapy for a rare but potentially deadly blood-clotting disorder, TTP. The researchers deliver this therapeutic enzyme via the cellular equivalent of a Trojan Horse, using tiny blood cell platelets as their protective delivery vehicle, with a key enzyme hidden inside. UAB researchers, led by X. 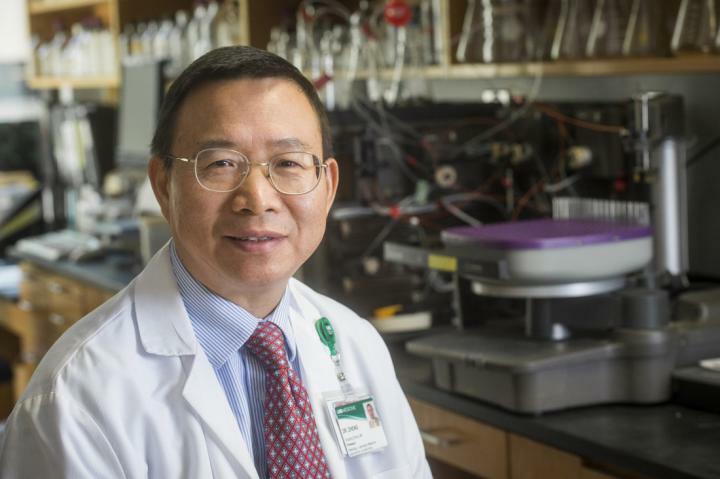 Long Zheng, M.D., Ph.D., Robert B. Adams Professor and Division Director of Laboratory Medicine in the Department of Pathology in UAB's School of Medicine, have now reported that platelets can spontaneously take up ADAMTS13. The enzyme stays stable in those cells, and the platelets can effectively deliver the enzyme where it is needed. In ex vivo experiments with human blood from TTP patients and in vivo experiments with a mouse model of TTP, the researchers showed that human recombinant ADAMTS13, or rADAMTS13, carried in the platelets can "dramatically" reduce the rate and final amount of blood clot formation in injured arterioles. "Our results for the first time demonstrate that transfusion of rADAMTS13-loaded platelets may be a novel and potentially effective therapeutic approach for arterial thrombosis, associated with congenital and immune-mediated TTP," Zheng said. "This novel approach could be translated to patient care once rADAMTS13 receives an approval from the U.S. Food and Drug Administration for therapy of congenital TTP." Other researchers have worked on therapeutic strategies to bypass the autoantibody for TTP treatment, with some success. However, unlike Zheng's platelet-ADAMTS13 approach, none of those strategies have addressed the underlying mechanism of TTP — a lack of ADAMTS13 and/or autoantibody against ADAMTS13. Co-authors with Zheng on the paper, "Transfusion of platelets loaded with recombinant ADAMTS13 is efficacious for inhibiting arterial thrombosis in mice and in human," are Mohammad S. Abdelgawwad, M.D., graduate student; Wenjing Cao, M.D., Ph.D., instructor of pathology; Liang Zheng, Ph.D., postdoctoral fellow; Nicole K. Kocher, research technician; and Lance A. Williams, M.D., associate professor; all at the UAB Department of Pathology.